Ahh the age of Instagram and Pinterest, how I love and loathe you so. Is it possible to have too much information at your fingertips? Too many ideas for one project? I often note how grateful I am that our wedding was before the days of Pinterest (remember those days? 10 years ago?). A much simpler time when inspiration came solely from a very specific search on the knot.com or waiting patiently for months for the new Inside Weddings Magazine to show up at the grocery store check out line. And now, after an unfortunate leak in our kitchen, we find ourselves thrown into the vortex of a kitchen renovation. In the age of Pinterest. With no budget for an actual designer. With three young kids at home. When we originally bought this house, which is almost 100 years old but the kitchen was redone at some point in the 90s, we dreamed of one day having the ability to make some cosmetic changes. In those days we talked about having a perfect white, bright airy kitchen. You know, classic white shaker cabinets, soft gold hardware, a strategically placed vase of olive branches. But the problem was, when we started picturing that kitchen in our house it just didn’t feel right. Our house with its creaky old wood floors, the dark moody light streaming through old tangly tree branches, the crooked walls from too many years of settling into the Los Angeles hillside. So we shifted gears and tried to imagine what this little cottage kitchen should be. The words we kept coming back to were cozy, warm, inviting, and yes, a little imperfect. 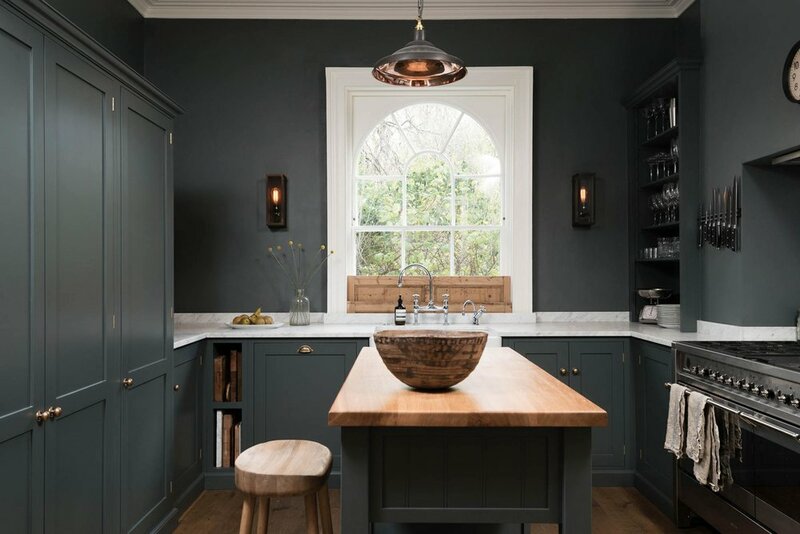 We started looking for photos that embodied these feelings and we were often drawn to projects from European design companies like DeVol, Plain English, and Neptune. They inspired us to focus on new construction with old world materials. Warm wood, timeless marble, antique details, handmade pottery, and yes, darker colors. These are some the photos we keep coming back to for inspiration. Warm, inviting, “I can’t wait to bake cookies in that kitchen” kitchens. We went back and forth for much longer than necessary on a cabinet color choice, solely because of this insanely beautiful kitchen. The simple warm oatmeal color is the perfect neutral for this cozy space. And I love how it allows the simple details to shine. 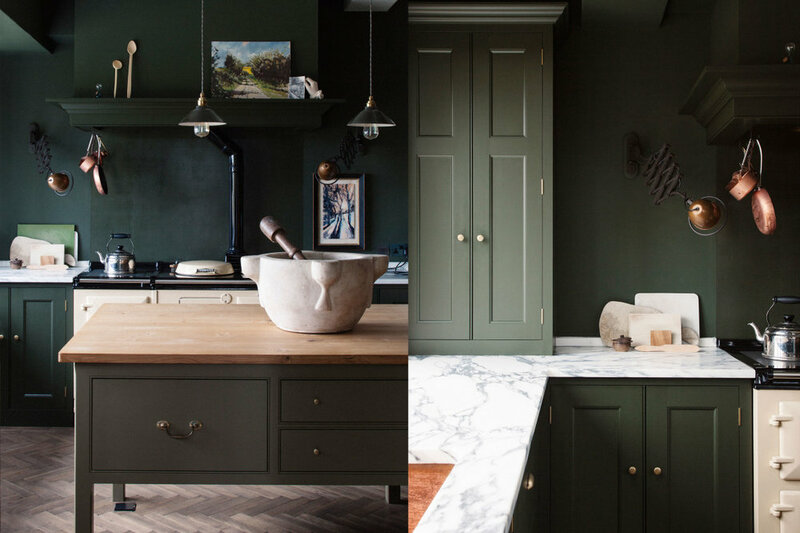 I adore the dark blue green shade of these DeVol cabinets paired with the aged brass hardware. 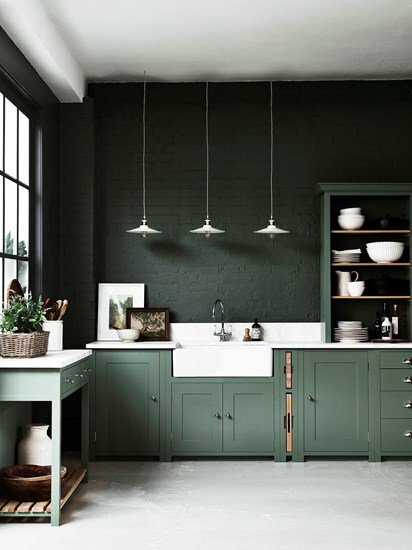 And while this kitchen has much more window light than ours, I think this color would translate into a darker space as well. I also love the warm wood counters but Alex was never too excited about the fragility of a butcher block counter top. This space just screams effortless cool. And although it isn’t at all screaming old cottage, I love the use of old world materials in a modern space. The Zellige tile backsplash and industrial pendant lights help to soften the sleekness of the dark shaker cabinets. Again more butcher block, which I love but it doesn’t seem practical for our lifestyle. This Neptune kitchen has been one we’ve come back to many times throughout the last few months. That beautiful GREEN! We’ve considered also having a dark tonal wall to match the cabinets, it just feels so cozy, but it may be too much in our house. And although I love the contrast of the bright white marble against the green, it feels a bit too new and modern for us. More green! 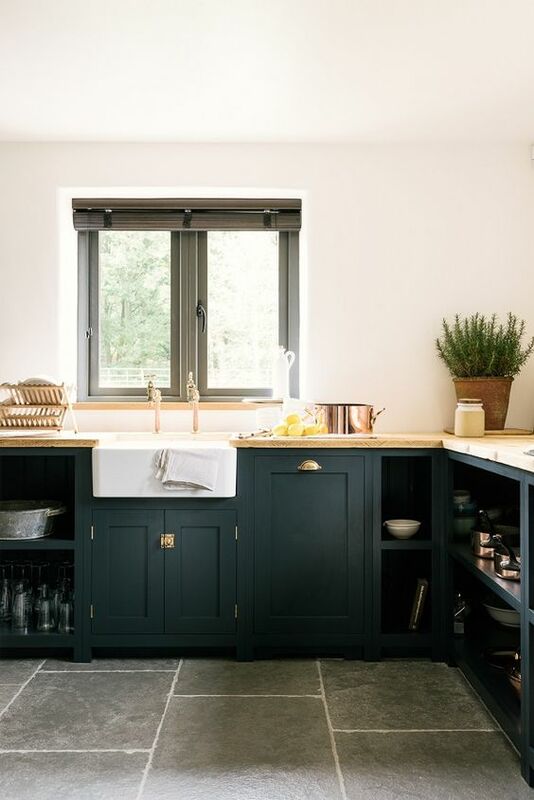 What’s not to love about this Plain English kitchen? The copper accessories, the veiny marble, the herringbone wood floor. It’s all gorgeous. I was really hoping for a hutch cabinet like this, but our galley kitchen layout just doesn’t have a proper space for one.